I am generally happy with my air cooler, but only under the conditions I use it. Let me clarify; This is a great SUPPLEMENT to an air conditioner. My bedroom will not cool down, no matter what temperature you set the air conditioner. The air cooler does a nice job of cooling it down up to 5 degrees (with cold tap water). Not to mention the added benefit of the humidity. I could add ice, which would greatly help, but that would be more work and would cause my fridge to output more hot air. (Simple physics - heat exchange. Too bad I don't have a fridge outside.) If you added ice, and your fridge was outside, it could MAYBE be a substitute for an air conditioner for one room, but I have not tried it. *It does have a remote and a timer which is nice. It also has different speeds which is nice, and includes some other useless buttons. *It will stop working once the humidity gets high. It helps to own a humidistat. For this reason, I use it only at night. 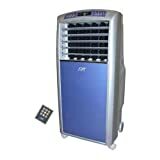 Of course, if you own an air conditioner, it will eventually take the humidity out of the air and you can use the air cooler again. *Even if you change the water every day, the pan will have to be cleaned well at least once a month. I used this in our bedroom in our small apartment on the water in Los Angeles. The company does make it very clear that it won't work well in high humidity environments but I would not characterize LA as being that way. With that said, the unit would pump humidified air into our apartment which only added to the heat we were trying to get rid of. People seem to have good luck in VERY low humidity locations, I figured around 50-60% was low enough...apparently not. The unit arrived scratched and damaged but the situation was remedied after a long series of e-mails and phone calls.